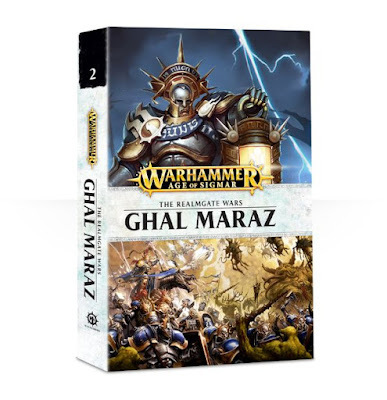 Ghal Maraz is the second novel in the Realmgate Wars series, and just like it's predecessor it acts as a companion pieces to a campaign book, this time The Quest for Ghal Maraz. Composed of two novellas it carries on the stories from the first book and brings them to their conclusions. So how does the second installment fare? Since this is actually two unrelated novellas I have reviewed each of them separately, so without further ado. The first novella in the book carries on from where Josh left off in War Storm. Gardus is now trapped within the Realm of Chaos and the rest of the Hallowed Knights must carry on without him. This throws their Lord-Castellant, Grymn, into the role of being a leader along with the Lord-Celestants from the other Stormhosts. The main plot line pretty much follows what was written in the Ghal Maraz source book. In fact, it was really very, very close to what was written in there. With Grymn we get to explore his character a bit more and see how someone not meant to lead deals with it. His mood is often very dour, and well, grim, and now as the de facto leader he must learn how to balance his moods a bit better. At the battle of the dirgehorn there is a rather cool fight between Grymn and Gutrot Spume. It was cut short unfortunately, but I guess you couldn't really kill either of those characters this early in AoS. Some of the most interesting characters in this story to me were the Nurgle ones. Morbidex Twiceborn had the most screen time, but we also got to see Gutrot, the Glottkin, as well as two new characters who represent the Nurgle sorcerer model and the plastic Nurgle Chaos lord model. To me it seemed like Josh had the most fun writing these characters when compared with the Stormcast. That's not to say he did a bad job with the Stormcast, I just feel like the Chaos characters gave him more room to breathe and infuse some of his own ideas into. Besides Gymn we also get to see the Prosecutor-Prime Tergus, who plays a rather major role and Morbus, the Lord-Relictor. The Primes usually seem to be a bit more interesting to me, just because they do not have a lot of the answers that their leaders do and tend to be a bit more wary and naive about everything. This allows us to explore the worlds with them a bit more. The Sylvaneth also get explored more in this story compared to the first. Josh did a really good job of making them feel believable and tragic considering the circumstances they find themselves in. All in all this is a solid story that kept me entertained throughout. I would have wished to see a bit more about the Stormcasts themselves fleshed out, but it didn't really detract from the story for me. I think this would have been better if they had kept the first half from War Storm and the second half from Ghal Maraz together into one novel, but I understand why they did it the way they did. More then the other stories, this one really felt like one longer story that was cut in two for the sake of the books. The second novella also carries on from the first book, finishing the story that Guy Haley started with Thostos Bladestorm. In this one we also get to see the inclusion of Vandus Hammerhand and Ionus Cryptborn as they join their forces to Thostos' in the quest to reclaim Ghal Maraz. In fact, the main viewpoint pretty much switches to Vandus in this one, but it's understandable considering Thostos' state. Having died at the end of his last story, Thostos has been reforged and is not exactly the same anymore. He is cold and distant and seems to be lacking some of his personality. This is actually a major plot point in the story, and one which I really enjoyed. Vandus has noticed the changes in his friend and is concerned about what that means for the Stormcast in general. He is genuinely afraid that this will happen to him or any of the men under his command. This type of philosophical and emotional doubt amongst these god like beings is what really brings a lot of these stories to life for me. It really humanizes them, and Vandus in particular. A character who started out running the risk of being too much of a goody two-shoes and ending up like Marneus Calgar in 40k, rather bland, has now had a ton of life breathed into him through the efforts of Chris Wraight, Nick Kyme and Guy Haley. He really is very human, and this makes him a lot more relatable. We also get a few scenes on the Sigmarabulum, Sigmar's floating fortress that encircles the remnants of the world-that-was. This allows us to explore the Stormcast at rest a bit, which is infinitely interesting to me. Sure, it's great to see them at war, but I think what really defines them is how they act towards each other and when their isn't an enemy in front of them to slay. Once they have departed for Chamon we also get a look at them preparing for war, which again, sheds a lot of light on stuff for me that the source books didn't cover. For instance, Sigmar has wizards that can magically repair buildings, in fact it looks like their is a whole organizations of support for the Stormcast. This is naturally assumed, but since we haven't seen anything about it yet, any insights into it are welcome. The other characters from the Hammers of Sigmar are equally as interesting, including their Castellant, Andronics. The quirks written into his personality are great and I really hope we see more of this. Demi-Gods with personalities and flaws are definitely more interesting then perfect murder machine warriors. I do feel like the second half of the story suffered a bit, but I think this is mostly due to Guy having to cram a lot into a small space. I feel like if it was up to him he would have stretched it longer to fill in the gaps more. There is one part, where they have to request aid from Dracothian, that seemed a little silly to me in the source book, seemed a little silly to me in the novella, and honestly felt like Guy thought it was a little silly too since this is where the story starts to sag a bit. One character's death is abruptly short and felt very under served. Besides just the Stormcast, the Chaos characters get plenty of screen time too. They are just as interesting, and there is a flashback to when Ephryx had first invaded the Hanging Valleys back in the Age of Chaos that I love. Again, it's because he succeeded in making them feel human, with human motivations. While I do wish that the second half of the novella had been given more time to breathe and find its own flow without a page limit, the story in total is very good. I really love all of the character moments and how much it explored beyond the battlefields. While both stories had their faults they also had their strengths. It's a solid installment in the series, and if you read the first book then it's pretty much a must read to get the conclusions to the stories. Since it follows the campaign book there wasn't much room for explorations as it's plot line was pretty much set, but both author's found room to explore within their characters and their personalities. I would recommend getting this, it wasn't as good as the first book for me, but it was still pretty good. I'm already reading the third book, Hammers of Sigmar, which follows no pre-determined plot so I am pretty excited to see where it goes.